You’ve heard of Once a Month Meals, right? Well, here’s a schedule for Once a Month Meals – the Home Canning version! Here are twelve store-bought items you will water-bath and pressure can at home this year. One food each month. No stress, a modest time investment, lots of healthy meal planning at home. This article is very thorough, you may want to grab a milkshake and a pad of paper for notes. First of all, deep breath, Sista! I know how you feel and I’m right there with you doing my Yoga belly breaths. It’s all going to be fine – things have a way of working out. Ok, so you don’t have everyone all together every night. Whatever. Just work with what you have and allow schedules to adjust as everyone sees that eating at home is important. Here’s a little article on improving the dinner hour together. Believe me, if you stay diligent about the family dinner hour, they’ll come around. Re-define how you think of the phrase “home-cooked” and be flexible. Some nights you might be in your kitchen an hour or two before dinner preparing beautiful, healthy meals. Spend some time planning those meals because they’re very special. Other nights, especially during the school year, you may be filling a slow cooker or solar oven in the morning and not thinking about dinner until two minutes before you serve it. On even busier days, you’ll be grabbing home-canned foods from your shelves and creating instant meals in a matter of minutes. These are your once a month meals! These are the days that will make the canning schedule suggestion below all worth it. Start this once a month meals canning plan and you will be able to eat healthy meals every day of the week with your family. So what if dinner is on your knees on a paper plate as you watch your kid’s soccer game? Does it really matter in the grand scheme of things if you’re slurping down stew from your once a month meals canning schedule about an hour before bedtime because that’s when you all got home from that awesome recital? Be together, eat good food. Have picky eaters? It happens, even in families where children are exposed to healthy foods at a young age. The best advice I have is to just keep trying lots of variety in your meal planning. AND, very important, ask your family’s opinion on recipes and meals. Find out what they like and then find ways to make those recipes healthier. It takes practice and hard work. Duh. In your once a month meals canning schedule, be sure to include the children in the kitchen. Have every family member help with some part of the canning process. Here’s an article that can help you get started with that. Also, be sure to read the article referenced in number 1 above – it really can help with this issue. You can’t do all the things every day. Is that really news to you? You’re one person and you’re doing the best you can. Roll your shoulders, lighten up and give yourself some room in your schedule to plan and prepare. This once a month meals canning schedule is going to help you stay focused – each month you just do one thing. If you want to do more, go right ahead! Otherwise, just stick to this once a month meals canning schedule and don’t sweat the small stuff. Home canning is NOT too hard for you. You CAN learn to do it – pun totally intended. To make it easier on yourself, though, start with water bath canning. The equipment is cheaper and the canning (or processing) times are generally quicker. When you’re ready, move on to pressure canning low acid foods like meats. You don’t have to be afraid of pressure canning. Like anything else, it just takes a little practice. A quality pressure canner is more of an investment, though. You can start with a modern Presto pressure canner, which are much cheaper. However, I can’t in all honesty recommend that you do. Prestos are fine for a season’s worth of canning, perhaps, but over time they can just plain wear out. Now, this list is SIMPLE on purpose. If you are an experienced canner and look at this list and think, “Bah, I can do this stuff in my sleep!”, go right ahead and customize it for your year and your family. You are a smart person and know what you can do. Inspire you to begin this year. The most important thing to do after you read this article is to write down your own plan. Write it on your calendar, in your homestead journal, on the back of your hand – whatever! Just write it down and tick off, one at a time, every item on your once a month meals canning schedule. To further round out your scheduling, I suggest reading Sharon Astyk’s Independence Days: A Guide to Sustainable Food Storage and Preservation . You can buy it with that link at a reasonable used price. It’s one of the best books I’ve read on how to make preservation a natural part of your year. Plus, it’s real – she’s a real gardener, with a real life and real failures along with her successes. These twelve items, one for every month of the year, will give you the component to healthy, home-cooked meals. No running to the store, no scrambling to get it all made in time. Just re-heat and serve! FYI, this list is completely adaptable to your region, farmers market, backyard garden, personal schedule and personal tastes. If you’re a backyard gardener, or you’re used to shopping your markets for seasonal foods, you’ll notice that this canning schedule follows the harvests. If you don’t know how to can these items, we’ve included instructions for each one. You can plan your trips to the farmers market or the grocery store around your canning schedule. Each item represents one facet of home canning onto which you can build. For example, when you learn to can carrots, learning to can potatoes won’t seem too hard because the process is pretty similar. FYI, if you end up needing to do it, here’s an article on knowing when to blanch your veggies before canning. Want This Information in an E-Book? Health Wise Food Storage – an E-Book created especially for our newsletter family members covering this Once a Month Canning Schedule, as well as tips and challenges to making meal time a healthier and happier occasion. PLUS, we included homestead-specific food storage information, goal prompts and brainstorming, along with an inventory sheet to get ensure you get your supplies organized this year. You will also receive the access code to our member-only Newsletter Family Library containing several E-Titles and resources that were specifically crafted just for you! Your access code will be included with your download upon completion of sign up process. Beans are a protein-rich addition to any meal. They will require a pressure canner to safely preserve. Grow a Good Life can teach you how to can dried beans here. Our favorite thing to do with canned beans is to make a quick refried bean recipe like this one from Attainable Sustainable. Or, this brownie recipe from Small Footprint Family – just replace the store-bought can in the recipe with your home-canned beans. Here’s a great collection of home-canned bean recipes from Rootsy Network. If you’re eating Paleo or Keto right now and don’t consume beans, try canning some extra batches of the things you can eat like broths and meats. Don’t procrastinate this once a month meals canning schedule just because yours will be different from mine. No excuses – it’s time to can! Simply adjust all of these months to fit your dietary needs, keeping in mind what’s fresh in your area at any time of year. Winter is a great time to plan to can meats because meat growers near you will be doing their yearly harvests in late fall/early winter. Take advantage of nutrient-dense local, healthly-raised meat and preserve it this month. Meat requires a pressure canner to safely preserve. Combine home-canned meats with broths and veggies for a tasty stew. Combine it with rice, quinoa or pasta with your favorite pasta sauce. Canned meat is highly versatile! The National Center for Home Food Preservation can help you learn to can just about any meat. Here’s how to can home-grown or store bought chicken from us here at Homestead Lady. Can corned beef – yum, yum – with A Farm Girl in the Making here. Can moose meat with my friend Amanda from Idlewild Alaska. If you want to combine the best of beans and beef, follow Angi at Schneider Peeps as she make a one-can meal of chili con carne. Here’s another from Angi that you might be ready to try, as well – beef stew. The beauty of having a stew already canned is that the kids can re-heat it for a quick meal even if you’re not around. Having soups and broths on hand make my life SO much easier. They will require a pressure canner to safely preserve. My friend Kathie at Homespun Seaonal Living is a soup canning guru – click here to read a great article on how to can soups. 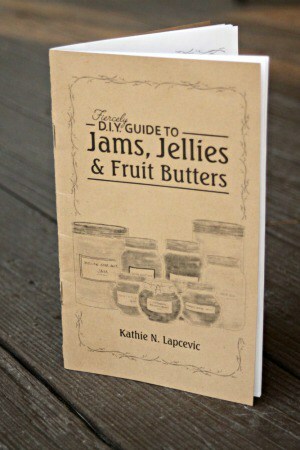 She even has a book on how to turn these home-canned foods into gifts throughout the year – I love this book!! You can read about it here. Here are two on canning meat broth, or stock. One from Reformation Acres, plus another from her on explaining how to peel chicken feet for canning (especially helpful if you’re growing your own meat birds on the homestead). Another article from Fewell Homestead that has a video with it. Broth can be added to any casserole, soup, sauce or even just a basic rice pot for added protein. Remember, with once a month meals from home-canned products, you will probably need to do a little mixing, unlike most freezer meals. Think about what components to meals you’d like most to have on hand. Is it meat? Carrots? Tomatoes? Maybe condiments like ketchup or pickles? The more you follow a once a month meals canning schedule, the more you’ll see the versatility of these products and be able to make quality plan to fit your family’s needs every year. Can I use Half Gallon Jars for Foods? If your family is smaller, go ahead and can up soups in quart jars with both meat and veggies combined. My family is rather large, so I usually can the various components of soup in quart jars – meat, veggies, broth. Then, when we’re ready to eat, I toss them altogether to make one meal. If I could use half gallon jars successfully in my pressure canner, I would because of the space and time savings. However, they tend to break and are not recommended for anything but high acid apple and grape juice. Darn it. Eh, that’s ok, the quart jars are sturdy and easy to store. All of these root crops can be canned handily in the spring. Carrots and beets are spring crops and you can preserve them fresh from the garden. With potatoes (which ripen mid to late summer or into the fall), you’ll be preserving the last of the previous year’s harvest that’s leftover in your root cellar. As long as the produce is free of mold or other imperfections, canning is a great way to save a product that is still good, but fading fast. If you don’t grow your own root crops, remember to check your spring farmer’s markets. Potatoes can be purchased in season and locally at the end of summer. Of course, you may see good deals on potatoes appear at any time of year in the grocery store. You will need a pressure canner for low acid foods like vegetables. Here’s a printable from Timber Creek Farm on how to can root vegetables – FYI, this link will take you to a free PDF to print. Here’s a good pickled beet recipe from Small Footprint Family. If you have golden beets, check out this unique recipe from Ann at A Farm Girl in the Making. Do I really need to extol the virtues of jam? Jam gives life to toast, pancakes, ice cream. Jam is a way to experience summer in the dead of winter. Most berry fruit is highly perishable so making jam is the perfect way to preserve this fleeting harvest. Jam is part art, part science and the more you make, the more varieties you’ll discover. We’ll limit our resources here to BERRY jams and jellies. Here’s my current favorite – Dark Cherry Mulberry Jam (you can also make it with just mulberries). Mixed berry jam with raspberries, strawberries and blueberries from 104 Homestead is a great way to use up random berries leftover from pies and fruit salad. Want to know the difference between jam and jelly (plus lots of recipes)? Here’s a post from Attainable Sustainable. The joy of having whole fruits on hand is that they make fantastic snacks and treats when you don’t really want something full of processed sugars. If you need a quick topping for pancakes, filling for crisps and cobblers or an impromptu winter fruit salad, these whole fruits will come in handy. A water bath canner is usually sufficient for fruits but be sure to check each recipe for instructions. Canning Peaches or Nectarines in honey or sugar from Family Food Garden. Canning apple slices from Reformation Acres. Spiced plums from Back to Our Roots – I’ve made this with and without the orange and its good both ways. Here are some canned peaches with chai spice, which sounds really tasty to me – from Attainable Sustainable. A quick note on using honey in place of sugar in canning recipes: always check your recipe! You are able to use alternative sugars in place of table sugar but you must still achieve the correct level of acid to safely can your foods. Simply Canning has this article on Substituting Honey for Sugar in your recipes which may be helpful to you. The best thing about pickles is that they’re easy to make in a water bath canner. They’re also wonderful additions to tuna mixes, quick grilled burgers and summer potato salad. All these meals whip up quickly and benefit from having relish on hand to add spice and flavor. Dill pickle relish with a secret ingredient for crispness from the 104 Homestead. Kosher dill pickles from Joybilee Farm. Bread and butter pickles from Grow a Good Life; also from Rachel is a great pickled garlic scapes recipe (especially good if you grow hard neck garlic in your garden). Dilly green beans from Attainable Sustainable. Also chow chow (a green tomato relish) from Attainable Sustainable. Zucchini bread and butter pickles from Family Food Garden. Pickled purslane from Homespun Seasonal Living. Pickled jalapeno relish from Reformation Acres. So, a pickle does not a meal make – unless you’re a college student. However, having homemade condiments on hand will help your meals come together quicker. Pickles, sauces and relishes are part of the spice that makes a meal a rich experience. They’re like that cha-cha pair of shoes in your closet. You may not notice their lack if you don’t include them in your outfit. But, honey, when you do wear those shoes, you look smokin’! Just can the pickles and thank me later. Once the tomatoes come into production you can start to drown in them! I dehydrate a fair amount of my tomato harvest because I like the ease of blending them to powder for sauces and paste. However, sometimes it’s nice to have spaghetti sauce, or other tomato-based sauces like barbecue sauce, on hand. Typically a water bath canner is sufficient, but be sure to check each recipe for recommendations. First of all, you’ll need to read this from 104 Homestead on how to peel tomatoes easily in case you need to do that for any tomato canning recipe. Canning whole tomatoes with basil and garlic from A Farm Girl in the Making. Seasoned tomato sauce from Grow a Good Life. Smoke barbecue sauce without the liquid smoke from Reformation Acres. Homemade V-8 from Urban Overalls – this stuff is better than store bought by a long shot. Cherry chipotle barbecue sauce from Nitty Gritty Life. Black bean and corn salsa with tomatoes from Schneider Peeps. Here’s one with a cousin of the tomato, the tomatillo – a recipe for roasted tomatillo green salsa from Grow a Good Life. You may discover that you have to work in more days for canning tomatoes on your once a month meals canning schedule if you really like having them on hand. The tomato harvest lasts clear into fall in temperate areas, so you are able to easily preserve them as often as you’re able. Canning tomatoes can be labor intensive, depending on how you do it. Be prepared to split up this job over days, weeks or even months if you discover you don’t have time to get it all done at once! Canned tomatoes are handy in so many recipes, so just keep notes on how many quarts you go through each year. Adjust your “once a month meals” canning schedule when you need to turn it into “three times a month meals” canning schedule. It’s all good. Italian caponata, or gvetch if you’re from Russia, is a mixture of tomatoes, onions, peppers, zucchini and even eggplant. It’s kind of like a “garden sink” recipe for the end of the season. This fits perfectly into your once a month meals canning schedule! If the acid level is high enough in these recipes, you can use a water bath canner; if you want to be safe without measuring your acid, use a pressure canner. Be sure to check the recommendations on the recipes and read up on Acidity in Home Canned Foods. These relishes are wonderful on sandwiches, topping baked potatoes and even as a pasta topper. I also dump a pint or two into spaghetti sauce to add some dimension of flavor and vegetables. Try a tablespoon on toast with a little feta cheese. A recipe for gvetch – a great way to preserve the eggplant harvest. Nothing says October like apples simmering on the stove! There are several ways to preserve apples and I’ll list a few here. Pear preserving is very similar to apple preserving, FYI. A water bath canner is great for apple recipes. If you’re new to canning, stick to applesauce. If you’ve made that before, you can try one or two of these other ideas. Caramel applesauce is a sweet twist on a classic taste; if you prefer a plain applesauce, simply use raw, granulated sugar alone in this recipe (as opposed to the coconut sugar it calls for). Seriously though, this caramel apple flavor is amazing! Spiced apple jelly from Grow a Good Life. Apple Butter from A Farm Girl in the Making. Apple pie filling from Nitty Gritty Life. Pear and apple jam from Timber Creek Farm. Here’s how to make Crabapple Jelly AND then how to Make Your Own Apple Sugar, both from Learning and Yearning. Don’t Skip Breakfast or Dessert! Apples fit nicely into a once a month meals canning schedule because they’re very easy to integrate into breakfasts and desserts. These two courses often get skipped because of time constraints. We all know that skipping breakfast is unhealthy, but what’s so bad about skipping dessert? Well, because we don’t skip it! Instead of eating home-baked treats from healthier ingredients, we grab something packaged while were out. Packaged treats are a nutritional wasteland. Ok, I’m done lecturing. Bottom line, don’t discount the place for home preserves to round out desserts in your once a month meals canning schedule. Cranberries are usually only for sale around this time of year and so I make sure I work them into my once a month meals canning schedule. Cranberries are best suited to speedy breakfasts and quick relishes over something like a pork roast. A water bath canner will do for these recipes. I also keep some cranberries in the freezer for smoothies throughout the year and for various recipes. However, power outages happen all the time where I live and I don’t like to rely solely on my freezer for food preservation. Whole cranberry sauce from Fresh Preserving. Cranberry honey mustard from Homespun Seasonal Living. Jalepeno red pepper jelly with cranberries from Family Food Garden. Cranberry Jam from The Self-Sufficient Homeacre. SBC Canning’s method for canning cranberry juice – this is really so simple and tasty. Pumpkin is one of my favorite things to grow in the garden and it’s really very easy to can with a pressure canner. If you run out of time because of the holidays, simply keep your pumpkin and other winter squash at room temperature out of the way in a pantry until you can get them canned up. Hard-skinned squashes like pumpkin will last for several months in a pantry closet. Do NOT put them in cold, cold storage or they’ll rot. When you’re ready to can pumpkin, follow the instructions exactly and use a pressure canner to put up chunks of pumpkin, not pumpkin puree. According to testing, pumpkin is not safe to can as a puree. Canning pumpkin from Simply Canning. Pumpkin cheesecake muffins from Attainable Sustainable. Pumpkin coconut almond granola from Grow, Forage, Cook, Ferment. Winter squash pie from Learning and Yearning. Gluten free pumpkin cheesecake from Joybilee Farm. Just for kicks, a simple handmade pumpkin soap recipe from Nerdy Farm Wife. 5 Recipes to Add Healthy Pumpkin to your Breakfast from Rockin W Homestead. Carefully use a spoon or butter knife to pop the seal of a jar of home-canned, chopped pumpkin. Set up a fine-mesh strainer over a bowl and dump the contents of the can into the strainer. Let the contents drain for a few minutes. Pick up the strainer and gently flip the pumpkin inside, using a circular motion to move the pumpkin around the sieve. It hops around as you flip it and the excess water fall through the sieve. If you still feel like the pumpkin pieces are hiding more water than you’d like to have in your puree, you can place a light weight (something like a ceramic bowl or a heavy plate) over the surface of the pumpkin to gently press out a little more water. Don’t apply so much pressure that the pumpkin starts pushing through the sieve, though. Leave this as long as the pumpkin is still weeping fluid. Remove the pumpkin from the sieve and place it in your blender body to blend into a puree. If you discover that your pumpkin is now too dry to blend well, add a teaspoon of your reserved fluid to blender body at time to loosen the mixture. As an alternative, if you like a chunky puree, you can simply use a stick blender or even your stand mixer to puree the pumpkin to suit your tastes. For something like a pumpkin pie, I keep my puree as dry as possible. For a pumpkin bread I leave it just a bit damp. Sometimes I’ll even add pumpkin puree to the dough of our traditional Christmas Tea Ring. Pumpkin goes with nearly everything – it’s a delightful vegetable. As a reminder, if you care to join our newsletter family, we have a entire library of free resources available to you. This once a month meal canning schedule is part of a larger book called Health Wise Food Storage. We’d be happy to have you join us! This is a great list and fresh ideas. Thanks for the suggestions. I better get busy! Thanks, LeeAnn! Have a great time making your gifts! This is such a fantastic resource! My garden is doubling in size this year so I really need to up my canning game! So glad it was useful, Laina! I find it’s so much less stressful if I have a plan and a schedule. Good luck with your garden this year! There seem to be some links missing under the “What Equipment Do I Need?” section. It says, “To water bath can high acid foods like jams, you’ll need one of these:” and then it’s just blank. And also, “See below for an example of what I mean:” —- I am not sure what this is referencing as it is again blank afterward. And also, “I’m saving up to buy this pressure canner, which doesn’t require a seal and is so reliable:” which doesn’t have a link. I’m super interested in what these products are as I only have a water bath canner right now. I’d love if you could correct this. Thank you for the great write-up! Spreading canning all throughout the year sounds much less overwhelming than cramming most of it in from mid-summer to fall. Thanks so much for stopping by and taking the time to point that out! I suspect you’ve fallen victim to slow bandwidth; something I’m a victim of all. the. time. There are Amazon link images beneath the text you mentioned, but it can take some time to load if your connection is slow or spotty. I live out in the sticks and sympathize! I’ll include text links so that you don’t need the pictures to see what I’m talking about. Thank you for pointing that out! Have fun with your canning year! Thank you for all the great information you shared. I’ve always wanted to start canning but honestly been a bit overwhelmed by it. The recipes you’ve provided all sound delicious and I think I might have to finally start my canning journey! So glad it was helpful, Nicole! You CAN do it, no pun intended. Start small, with one thing and get really good at that. No rush. Start with water bath canning – cheaper equipment and jams. Yay! Wow! This article covers so many things. I have never canned before because we’ve moved annually. But now that we are settling down, I’d love to start canning! I will keep this to remind me about when to can what! That’s super helpful for us newbies! Thanks so much! So glad you found it useful, Allison! We’ve moved quite a bit, too, and it can be daunting when thinking of starting new projects. It usually takes me a full year to recover from a move. Good luck with your efforts this year! !